Herodias held a grudge against John and wanted to kill him, but she could not because of Herod. Herod was afraid of John because he knew he was a good and holy man, and so he kept him safe (verses 19-20). On the 11th November 1880 a twenty five year old man mounted the gallows of the Old Melbourne Gaol. He had been surrounded and captured at a place called Glen Rowan in north-east Victoria. His brother Dan, and friends Joe Byrne and Steve Hart were killed in a shoot out with the police. Of course, I am referring to Ned Kelly the famous Australian bushranger who lived in the harsh and rough tumble times of the early pioneering days of our country. Ned has of course attained legendary status in Australian culture. Opinion is divided about what kind of person Ned really was – someone driven to crime to support his family in harsh times, a ruthless and cold criminal, a persecuted freedom-fighter, a rebel against the authorities and injustice – maybe he was something of all of these but there is no doubting his iconic status in this country. As the noose was placed around Ned’s neck, his last words were, "Such is life". We’ll never know precisely what Ned meant by those words but this saying is one of resignation, inevitability, and acceptance; there is nothing that can be done to change the way things have turned out. It’s the same as saying "That’s the way the cookie crumbles" and I’m sure you can think of other modern equivalents. We don’t know what John the Baptist’s last words were but maybe they included a similar sentiment to the saying "Such is life". You see John was constantly on a collision course with the authorities. He blasted the religious leaders calling them a bunch of snakes. He clashed head on with Herod Antipas and his wife Herodias publicly accusing them of adultery and other evil deeds. John especially annoyed Herodias who developed a murderous hatred for him. John wasn’t afraid to call a spade a spade for the purpose of calling everyone, from the most humble to the highest authorities, to repentance. So it would have come as no surprise to John when the executioners entered his gaol cell. There is a certain inevitability here. When sin is confronted head on there are those who will take offense and strike back. Mark goes to great lengths to tell the story of John the Baptist’s death. It’s no bedtime story. We find John languishing in prison. Herod feared John as a holy and good man but was too proud to release him. In the background his wife Herodias seethed with anger against the man of God. The story becomes the stuff that horror movies are made of. At Herod’s drunken birthday party Herodias made her move. She asked her teenage daughter, Salome, to do a belly dance for the king. The dance was obviously sexual and provocative in order to get her own way with the King and she was successful. He boastfully promised before the whole court to give the girl anything she asked. Salome was prompted by her mother. The girl demanded, "I want you to give me here and now the head of John the Baptist on a plate!" (Mark 6:25). Up until now Herod had revelled in boisterous partying but Salome’s demand instantly sobered Herod. He was reluctant to grant the request but felt he had no choice in the presence of his guests. He dispatched his guards and John’s head arrived back on a plate - a gruesome and bloody spectacle indeed. The question that intrigues the reader is why Mark adds this story to his gospel. Mark doesn’t like to get off track in his account of Jesus’ life. One story quickly follows another. A favourite connecting word, used by Mark between scenes is "immediately" or "straightaway." No time for long descriptions and lengthy teaching. The language he uses is short, concise, and presents the bare facts. Mark races on telling one event after another and he doesn’t slow down until Jesus begins his slow, final march to Jerusalem and to his betrayal, trails, suffering and death. What makes this even more intriguing is that immediately prior to recording this gruesome story about the death of John the Baptist, Mark tells us that Jesus has sent out his 12 disciples with specific instructions on how they are to travel from town to town preaching, teaching, healing and driving out demons. The disciples come back and report to Jesus everything that had happened. But in between the sending out and reporting back we have a 15 verse diversion as Mark retells the story of John’s death. As I have indicated this is really unusual for Mark. He is not some wordy preacher prone to numerous digressions. That’s not his style. Yet he does it here in chapter 6. In fact he gives us the most detail about John’s death of all the gospels. Why? The most obvious and least important reason why Mark digresses with this rather lengthy account of John’s death is that John was too important a figure to have him just disappear from the Gospel story. Mark begins chapter one of his gospel with John preaching and baptising and urging people to prepare for the coming of the Messiah. John had a powerful influence long after his death and many of his disciples became followers of Jesus. Even though Mark is totally focussed on Jesus, John is too important to be left out. However, far more importantly we need to consider this. As Jesus sends off his disciples he warns them that there will be those who will not welcome them or their message. He tells them, "If you come to a town where people do not welcome you or will not listen to you, leave it and shake the dust off your feet". Most likely this kind of warning came as a surprise to the disciples. Why? So far in Mark’s gospel they have seen one success after another. Jesus was warmly received wherever he went; they brought him their sick, they listened to his teaching, he calmed storms, defeated demons and the first hint that we get that everything may not go as smoothly as first thought is when Jesus himself is not accepted in his home town, Nazareth. This rejection at Nazareth is a warning to the disciples that ordinary people – mums, dads, grandparents, tradesmen, business people, church people – will reject their message. And then comes the account of John’s execution and the disciples are warned that opposition to the gospel will also come from the most influential people in the world, including kings, queens, and parliaments. What happened to John the Baptist could happen to Jesus and his disciples. In spite of the fact that John had been doing God's work preaching and baptising and many people had heeded his call for repentance, nevertheless John ended up in prison. Worse than that, his head was served on a plate to satisfy the vengeful heart of an adulterous woman and the vain boasting of a king. Mark is telling us "Such is life for the Christian". It is inevitable that when the Christian speaks and acts according to God's will there will be opposition. Faithful discipleship is not easy. Evil does not easily give up. Faith will be severely tested. The enemy will appear to be far stronger and easily able to snuff out the lives of the bravest and most loyal teachers of God's love and forgiveness. Almost all the disciples were killed at the hands of their enemies and ever since that time Christians have faced the cruel anger of those who oppose Christ and his messengers. Wasn’t this Jesus’ own experience? This is another reason Mark includes this account of John’s death. It’s a kind of foreshadowing what will happen when the authorities oppose Jesus and how Jesus’ own resolve to follow God's ways will be tested. He too will face the full force of his enemies, suffer and die a painful and cruel death. In both cases, it seems that the power of evil has the final say over both John and Jesus. It’s true that Herod, the Sanhedrin and Pilate had the power and were capable of horrible things but in the end they didn’t have the victory. The story of John’s death in the middle of the account of Jesus disciples being sent out to preach and heal is a reality check for every follower of Jesus. It is inevitable that there will be times when we will meet opposition and our commitment and loyalty will be tested as Christians. Any kind of easy ride is out of the question. There will be times when we will fail to be the shining lights of Christ’s love and let evil win the day. As we reflect on our own loyalty we have every reason to be ashamed. We have compromised our relationship with Jesus so often and preferred to hide away, make excuses, blend in with the crowd because we are afraid that standing up for Christ will compromise our standing in the eyes of other people. We join with the apostle Paul and repent that too often we have done the things we know we ought not to have done. We have let evil win over us and we have not spoken or acted in love either for Jesus or the people in our lives. always wanting our way and not caring about the ideas and opinions of others. Evil tried to silence John and Jesus. The evil in us and around us will try to silence our witness and undermine our faith. We will be defeated again and again but the final victory is ours. Jesus has made sure of that. When we are feeling low because of our lack of faith and commitment to following Jesus, he assures us that through his death and resurrection we have been made right with God. Our guilt has been abolished. We have been made clean in the blood of Jesus. His promise to love us, forgive and accept us stands firm and sure. We heard this in the reading from Ephesians this morning, "By the blood of Christ we are set free, that is, our sins are forgiven. How great is the grace of God, which he gave to us in such large measure!" (Eph 1:7-8). 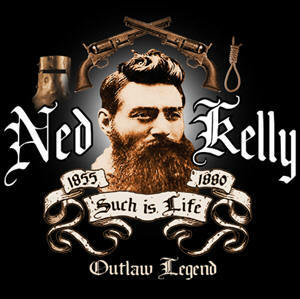 Ned Kelly’s last words "Such is life" indicate that it was inevitable that his crime would catch up with him and that justice would one day lead him to the gallows. It is inevitable that our faith in Christ will cause others to oppose and offend us. With faith and trust in Jesus who is travelling by our side, there will be setbacks, but even when we are the lowest and the least, the love of Jesus and his forgiveness for each of us is certain and sure. "Such is life for the Christian" – God has chosen us to be his through our union with Christ, so that we would be holy and without fault before him. (Eph 1:4).